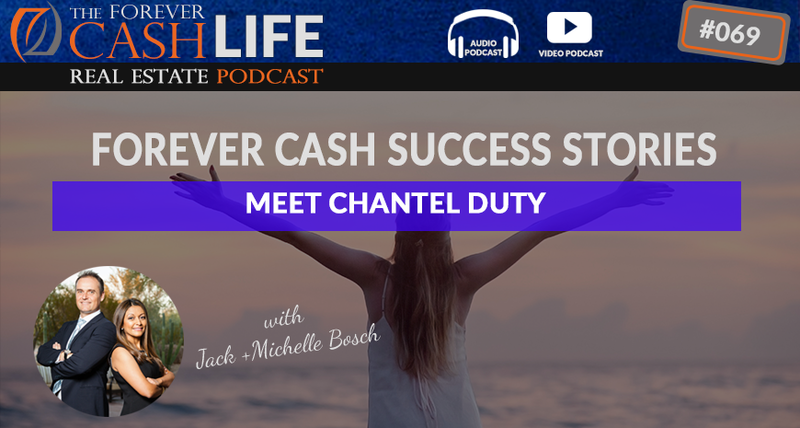 Jack Bosch talks to Chantel Duty, a Forever Cash student who has completely changed her life by flipping land using the Forever Cash method. In this episode you’ll get some insider perspective into the life of someone who is on the road to financial freedom! You’ll learn about some of the amazing deals that Chantel has done, as well as some of the interesting challenges she’s faced and how she’s overcome them. Land flipping has completely changed the way Chantel and her family view money, and has allowed them to drastically improve not only their standard of living, but their outlook on life. If you’ve ever wondered “what is it like to get started with Forever Cash?” this episode is for you! Don’t assume things based on your own preferences – you are not the market. Jack: All right, hello to “The Forever Cash Life Real Estate Podcast.” We’re going to talk about how to generate cash and cash flow from land today with my guest, Chantel Duty, and she’s gonna…yes, I’m gonna introduce her in just a second and she is going to…we’re gonna talk to her and see what she has been doing in the land business, how experience has been, some of her deals, how she has made $37,000 or $38,000 in her first couple of deals. And we’ll get started in just one second.Recording: Welcome to “The Forever Cash Life Real Estate Investing Podcast” with your host Jack and Michelle Bosch. Together, let’s uncover the secrets to building true wealth through real estate and living a purpose-driven life. Jack: All right, Jack Bosch here again and let me first introduce our guest, Chantel. Chantel, how are you doing? Chantel: I’m doing good, thank you. Jack: Wonderful. Can you first of all tell us a little bit…let’s get right away, jump right into it. Tell us a little bit of your history. Tell us who you are, where you’re from, where you live, how you got into real estate, and things like that. Tell us, like, your beginnings in this industry. Chantel: Okay, my name is Chantel Duty and I’ve been in real estate investing for almost five years now. And I started out with my husband and I just go into a weekend seminar. He’s super skeptical. And so I’ve always wanted to work from home. It’s just kind of been a side thing I’ve done outside of my occupation and I found that this was a way that I could do that. So just little by little, the last four years, I’ve just been self-educating, doing a few trainings here and there and then I got into land about a year ago. Jack: All right, wonderful. And before that or in parallel with that, what do you do otherwise? Chantel: It was in Yuma. Actually, before I moved there, I said something about there was no drive-through coffee stand so I started the first, I guess, drive-through. Jack: Now it’s all over the place, like…what center? Something Brothers. They’re everywhere, their company grows. They’re everywhere. As a matter of fact, I tried to sell a piece of land which I just sold. We bought it, we put on a contract for $92,000, just sold it for $220,000. The buyer is most likely going to put potentially a drive-through coffee shop on that thing. Chantel: Yep. Yeah, they’re all over. Jack: Yeah. Well, and they’re very nice. And then you sold that and where do you live now, again? Chantel: I’m back in Montana. Jack: Montana. All right, beautiful Montana. Flipped a lot in Montana, too. So now how did you come across land flipping? Jack: Very good. Now before you got into land, you said you were in real estate for five years now. Have you done deals before that already? Chantel: Yeah, primarily just houses. Jack: Houses, okay. So now if you compare houses or what, like, if you’re happy with houses, why move over to land or were you not happy with houses? Chantel: I was happy with houses. I guess the biggest challenge is living in Montana. It’s not a metropolis so you have to go to the other cities in Montana. So, you know, finding people who will go look at the houses, getting access to the house. Sometimes if people have belongings in there, it’s little worrisome, you know, that you can trust the people that are walking in and out, stuff like that. It’s just there’s less details to worry about with land. Jack: Yeah, less red tape, less about… So with houses, would you say it’s accurate that there’s just more different things that you have to handle? Like, starting with knocking at the house, right? Jack: Right. And nobody is gonna shoot you. Jack: All right. Okay, so it makes sense. So, you’re in a market, and that’s probably quite frequently in our customer base that somebody is not living in Atlanta or in Phoenix or in LA or in wherever the market is hot and they’re living in a smaller town where the inventory is also…availability of deals is somewhat limited, right? Jack: Right. Okay, cool. So then you found land and then you got started then, now, tell me what have been your biggest challenges yet also your biggest fun factor in the land business? Jack: But you could fix…you’re mainly operating kind of, like, around where you live? Chantel: Yeah, I mean, that’s where I started. Was just the areas around where I lived and so it’s a lot of rural Montana, a lot of mountain area. And so there are literally people who stand around with a gun and don’t want somebody coming through and then it ends up in a court case. And so I appreciate that, you know, you would think that the property owners wouldn’t disclose that to me, but I appreciate that they did because it sort of tells me that there could be some issues there. Jack: Right. But with that having said, have you had the experience…have you tried selling the property to the actual neighbor himself? Chantel: You know, I have not. I haven’t, but there was an instance where I was talking with the seller and he ended up doing that. So I knew what I was gonna go for because that guy wasn’t wanting anybody to come through and then I ended up following up with him and he’s gonna sell to that neighbor. So it is a good [crosstalk 00:07:15]. Jack: Okay, so you didn’t get the deal but in those situations, I mean, this is kind of, like, one of our core beliefs, where there’s a problem, the solution is if you can solve that problem, then you can make money. Jack: So as a matter of fact, my opinion is that every product that you have ever purchased is there to solve a problem. Even, like, I got a bottle of water here, the bottle of water is there to solve the problem of thirst. Now you could go to the sink and just drink like this, right? But this solves the problem of being portable water, right? Not portable that too, but portable, you can take it with you. So the bottle itself solves the problem of being able to take it with you. The glasses solve the problem of being able to see, right? The pen solves the problem of being able to otherwise chisel into whatever, like, the old drawings. Chisel into, like, into stone boards and things like that. So all of this, everything out there is a solution to a problem. So if you have a problem, because of that problem, that’s perhaps why the sellers, in this case, sold cheap to you. And if you can solve that problem either by selling directly to that guy that wants nobody around or by passing it on to somebody else who is willing to do that fight because the court case doesn’t have to be expensive, right? So you can go to a court case on the property that once you go to the court case and you get access to it, you might have added $100,000 value to a property, in some cases, I’m out there but in other cases, you could potentially add $100,000 value to the property. So if you buy a property that with all access and everything is worth $150,000, you buy that for $10,000, sell it to somebody for $30,000, you make $20,000, they go spend another $20,000 in a court case and now they made and added an extra $80,000 for profit to the deal just by willing to do that. Now, we don’t go to the court cases, we just flip them and go through them but if you think about it that way, then, yes, these are challenges, but you can also go around them. So very cool. But having said that, so these are challenges now that sometimes happen which you can avoid by just simply going somewhere else because that’s the beauty of the land business, right? You can be anywhere in the world, anywhere in the country. But then what are the same things that you really enjoy about it? What was kind of, like, your funnest kind of part of the land business? Chantel: Oh, gosh, really? Well, I guess the most interesting was probably just flipping a property very quickly that I thought was the most least appealing property ever. And it was really funny because there was people…there was, like, three people who wanted that property and one girl who ended up buying it. I kind of had a verbal agreement with the guy. He made it sound, like, he had the cash to close, came to find out he was still having to finance about 10,000 of it. And a lady called me the next day and it was before I found out he wasn’t absolutely ready to close the deal and she was like, “I’ll offer you more money than him.” And I was like, “You know, I have to stick with what I told him but I’ll get back to you if it falls through.” Then another neighbor saw the sign and he calls and so I was just…I’m like, “Really? It’s like the last place in Montana I’d ever wanna live probably.” But they liked it because there were no restrictions. The one guy lived down the road. So that’s obviously why he wanted it. The other two just wanted to basically do a business out there that had no restrictions on the building that they wanted to put up. Jack: All right. This is the beautiful thing about it. I love that, the experience, because there’s a saying that we say, that is, you are not the market. You don’t wanna live there, you live in what looks like a nice house. And you don’t wanna live out there somewhere in the boonies on some property of whichever way they build it and run a business out there, you want…but somebody else does, like, somebody else has that dream and as indicated by the interest, three people were fighting over it and that happens actually quite a bit. And I’ve had a property that had a huge dry wash, like a dry riverbed going through it and we got it for $900 and it was 20 acres and we were like, “Nobody ever is gonna want this property.” But for 900 bucks, we were like, “Yeah, what the heck, let’s just put it on the contract.” Right? So we put it in a contract, we put it out there and we had a bidding war over it. And somebody bought it for…I mean, it wasn’t that much, but somebody bought it for $10,000 and we made a $9,000 profit on that deal. Why? Because this area apparently is known for, like, semi-precious gemstones like Jade and things like that. So that lady wanted to actually go and basically spend two weeks a year out there only with her RV, put the RV out there, spend two weeks a year just basically looking for gemstones. Jack: You won’t find me ever in that property, right? If I want gemstones, I go to the jeweler, right? Jack: But she was looking for those things and probably over the years, she will make more money on that property than she paid for it and that’s her hobby. So the thing is, you never know what people are looking. So I’m very excited. Obviously, the non-restriction piece is also huge. If you have a property, like, for example, our students that deal in like the Florida, Georgia area, the number one question they get when they sell a property is, “Can you put a mobile home on there?” Can you put a mobile home on there? So it’s a question they get all the time. So the part of the society that likes to live in mobile homes is struggling right now because more and more mobile homes are being closed or they want a little more space, but a lot of the properties in the country have restrictions that you cannot put mobile homes on there. So when you find a property that has no restrictions even though you wouldn’t wanna be caught dead on that property, it still is super appealing to a good, good part, and I’m talking millions of people in the country that are looking for lots like that for various reasons. So congratulations, yes. This is kind of the thing and this is one of the biggest differences in the house versus land world particularly if you deal in the outskirts of town and more rural areas, that in the house world, everyone looks for that fixer upper that they can make the jam in the neighborhood. In the land area, what we’re doing is we’re looking for properties that have possibilities that fit the dream of somebody, right? And these three people, they all had dreams for that property. So I think that’s beautiful. That’s beautiful, great. So now tell me about your largest deal and…now, tell me about when you got into the land program, you got obviously our course and you did enroll in mentorship, what was the reaction of your family to that and those around you? Chantel: I guess I didn’t really say much to anybody because I kind of wanted to keep it under my wing and not really say anything. Chantel: Well, honestly, it was because I was a little bit skeptical about it and I wasn’t really sure and really when I got into flipping houses, I just learned early on to not be greedy. If you can make 3,000 a house and just keep doing it and doing it and doing it, and so when I got into the land, I really didn’t know how it was gonna work out. And then when I did end up telling my husband, he kind of got excited as we started going out looking at land and then he was like, “Oh, maybe we can get this for ourself.” And, you know, as we started looking at more and more properties, yeah, it’s just interesting, you know. Jack: That’s an interesting thing and you’re not the only one. I mean, people have gotten burned in real estate because there’s a bunch of fake gurus out there. There’s a bunch of people that just talk, talk and they tell you something that never works. They make it look, like, tomorrow you wake up and you’re wealthy and all those kind of things and lots of people fall for that. Lots of people pay, like, insane amounts for subpar coaching or mentorship to then have nothing to show. So I don’t blame you for keeping it under wraps because if you…like, you didn’t know yet how good this works. I didn’t know yet if we had a real deal, right? So if you get into something new, you don’t wanna say to everyone, “Hey, I’m going to do this,” and then you end up falling for some frauds and all of a sudden, it’s the fraud land guy looks bad, but you also look like that in front of the people. So we see that a lot but then once the deal is happening and all of a sudden the people come forward and it’s like, “Well, I haven’t already told anyone.” But now they’re telling everyone and now they’re bringing friends with them because obviously, it’s proven. Now have you tried anyone else’s program before? Chantel: I did do one but I didn’t take it really seriously because it was kind of, like, a wholesale setup where you found properties for the developers. So he was really looking for properties that work, like, sub-developments or areas he could develop. Whereas with this, you don’t teach us to find anything with any restrictions. I mean, some of the properties I found, it’s like people just wanna go out and build a bunker and not be bothered. They don’t care about utilities. They’ll, you know, throw a water tank out there and put some solar panels up and they’re happy. And so I guess there’s less restrictions with the way that you teach it than the one that I had looked at previously. Jack: Yeah, wonderful. I mean, there’s different markets. I mean, we typically go after several just for the person watching this to know. But typically, we’re after three kinds of properties. We go after the properties right in the outskirts of town, we’re going after larger acreage in the more rural area like an hour, two hours, or three hours away from town. Also, we’re going after the infill lots in the city. The property that I put under contract for 92,000 and sold for 220,000, that was an infill lot, right? That was an infill lot right on the main route, right? Another property, we just sold the property literally today, we put it under our contract on the selling side, property that we bought for $10,000, sold for $47,000 that’s actually in Colorado and it’s a 40 acre parcel, right? It’s in an area where people grow a lot of weed because Colorado obviously has, like, almost very few restrictions now. So it’s very interesting to somebody to go place whatever facilities there to grow a lot of marijuana, right? I’m not into that, right? But they are and so it fits their needs. The infill lots is gonna become a coffee shop or a restaurant or something like that. A rural lot out there might become…a doomsday prepper might be interested in it and might want to put a bunker and solar panels exactly on there. So every lot has kind of, like, different uses but the key is, the less restrictions it has, the better it is. So that’s always a key thing here. So, very good. That’s a very good observation about the restrictions. And now just walk us through those couple of deals that before we started here, the recording, you told me about you made something like $38,000 on the first couple of deals. So tell me a little bit about those. Chantel: Well, the very first one I did actually before the coaching, it was…I guess you could call it my experiment property and I had sold a house so I ended up buying it just because I bought it for, like, 17,000 and I knew it could be worth about 36 or 40. And I went ahead and listed it with a realtor because there was enough profit there. And it was funny because I looked into the company who owned it before me and it was a brokerage company and they had a lot of land and so I ended up hiring the realtor who knew a lot about that because it was kind of in the outskirts. I mean, people had to haul their water out there. And then I had another realtor who called me. She was like, “You’re not gonna get more than 18 for that property.” And I was like, “I don’t know.” Well, I ended up buying it and I doubled my money so…and it was because I listed with that realtor. So that was really helpful. Jack: You bought it for how much? Chantel: I bought it for about 17.5 and sold it for 34. Jack: There we go. That goes to show that the realtors out there don’t always know their numbers and there’s also nothing wrong with listing a property with a realtor. Now, most of our properties are not listed with realtors. The one in Colorado was not listed with realtor, it was listed by ourselves. The one infill lot that we just sold for 220,000 that one is listed, or was listed with a realtor because that is one of the major land brokers in that town. So I found him and he listed it, he has all the connections and we were able to maximize profits on that thing. Go ahead. Chantel: Yeah. Well, when it gets down to the last minute, I’m just on my knees asking God, you know, “Tell me what to do.” And man, I went through…actually, the title company sent me some information that had the people who developed that area. So I called them and that guy was like, “Oh, yeah, we saw that property even pass for 40,000.” I’m like, “Okay.” So I was like, “Well, if I end up buying it, I’ll have you list it.” And so I did and I dropped it and he sold it right away. I dropped it to like 34. Chantel: Yeah. So when I got in the coaching program, I got a few contracts, about four contracts probably and I could really see the value. I had these and it was actually one seller who had two 20 acre lots right next to each other. Well, there was two neighbors out there who were really interested and one guy didn’t have the money. Excuse me, the lady that lived right next to them, she was just dragging her feet. They really wanted to buy it because they didn’t want anybody next to them. But I just never heard back from her and then ended up having somebody buy both of them at once. So I closed on both of those with the same buyers. Jack: You made how much? Chantel: So I don’t remember money on that one. I think I bought them both for about 37.5 and then I ended up grossing 36. Jack: All right, so you sold it for 70 something. Jack: Now do you actually buy them yourself or do you just put them on a contract and market them? Chantel: You know, I think one of them, I sold the contract and then the other, those three I ended up buying. I know that’s not what you teach, but I guess I just have a hard time letting go of it when I know it can turn around and if I have the funds to do it, you know, if you don’t, then you kind of have to say goodbye, but it worked out. Jack: Wonderful. Yeah, and that actually is a very good point that you bring up because a lot of students that we have that start without a lot of funds, it’s a perfect way to them to start up because they just put a property under contract and then they go market it afterwards and then they do what’s called a double closing or a ABC closing or there’s different kinds of things like same day closing where they buy it and sell in the same day and they use the buyer’s money to pay for everything. But when I started, I didn’t even know those things. When we started at the beginning, literally, we put it under contract, we marketed it, and then we literally just used credit card money and lines of credit from a credit card and stuff like that, do you know those checks? We cash them, we buy the property with that and then we would sell it the next day, didn’t even know we could do that simultaneous closing, it’s another term for it. But as soon as we had made some money, we started doing what you’re doing. We started actually buying them because if you get a killer deal that you know has $20,000, $30,000 of profit in it and you know you’re getting it for a bargain price, then why not? If you have the funds available, go and do it. Another couple of our students from…actually somebody from Germany, they did the same thing, they had property that they just got and I’m mentoring them personally and they gotten four lots in Florida valued at the very least, very conservatively speaking, at $160,000, they got them all on a contract for I think 60. So they ended up doing that. They had access to the money so they bought it and now they’re selling the first two already for probably…it could be that they’re worth even 60 a piece. So we conservatively estimated the minimum is 160 which means makes each of them worth 40 but most likely, more likely, they’re worth, like, in the 60s. So they’re selling theirs for, like, 45 a piece. Then we have the first two that they have multiple people looking at. So the first two, they’re gonna already make 50% on their money and then they still own two where they make another $90,000 on it. I mean, it’s really amazing. And the only way they could have done that deal because that guy really needed the money by a certain time is by actually buying them. So sometimes you come across deals that if you have the cash, the best way to do it is to actually just buy them. If you don’t, you can still do other things. For example, in our community, we have people that are private money lenders. They are people that have cash, they’re willing to cooperate with buyers for a piece of the deal, obviously, but they’re saying like, “Well, you need…” We have had one case where somebody needed, like, $110,000 to buy a deal and this private money lender in our group became forward, he funded the deal and then they sold it for, like, 170 or so, the private money lender got like $20,000 but they still made, like, $40,000 on the deal. So there’s multiple ways to skin that cat and we’ll talk about that in future podcast episodes. Great. So you have more deals under contract right now, you have more deals in the process and how does it feel now? Chantel: It feels good. I mean, you obviously get more confident with the more experience you get. You know, the questions to ask. So, yeah. I actually bought another property, so I’m kind of sitting on it and trying to get it sold too and it’s funny because, like, nothing happened through the month of Christmas and now I’ve gotten about five calls on it, so it’ll be good. Yeah, you just kind of reinvest your money. You know, when you get started in this and you think about the money you’re gonna make, and you’re it’s like, “Oh, if I had 10,000 in the bank.” And then it’s like, “Oh, if I had 25.” And it’s funny because it’s, like, my son asked me for money to go do stuff. I’m like, “Dude, I don’t have any money, it’s all invested in properties.” You just keep reinvesting, reinvesting and it’s just…your nest [SP] just keeps growing. So that’s exciting. Jack: Yeah, exactly. And soon enough, you have hundreds of thousands of dollars and then you sell them all and all of a sudden you’re literally sitting on six, seven figures and that’s exactly what happened to us. When we first made deals, we just put them in, put them in, put them in. We never had cash but then all of a sudden, once we sold, like…in one month, we sold like 15 properties one time and all of a sudden, we were like, “Man, we’re sitting on, like, a quarter million dollars.” And never in my life before did I even conceive having that level of money. Now, obviously, things have changed. We have since done 4,000 deals but that first time, it just blew my mind and it almost changes your way of, like…it levels you up in terms of, like…it levels you up your normal, right? Because you normally have $2,000 in the bank account, now you have $100,000 or $200,000 in the bank account, you’re like, “Well, I’m playing business and life on a completely different level.” Have you had that experience already? Chantel: Your mentality changes and you just stop thinking about what you could do with the money and you just keep reinvesting and it just keeps growing. Jack: And your level of confidence, your level of capability keeps growing and the same thing happened to us right now. When we just bought this apartment complex with 147 units, we literally had, like, a little bridge loan of a million dollars and they gave me a check for a million dollars, never received a check for a million dollars. Now it’s a loan so I have to send it…we have to pay back but I deposited that check and the banker was like…even the banker was like…you could see him, like, double taking or double take at it and then depositing it. But then you know what? Two days later, we had to send out almost $3 million to come to the closing table. So the bank accounts went from, like, three point something million dollars to $200,000 which is the money we need for the capital expenditures and for repairs and so on. But it does get you used and that’s actually a very important skill and important life thing that it gets you used to higher numbers in life because most people have lived their life dealing with a $2,000 paycheck, a $3,000 paycheck, $300 a check that they write for $57, for $300, for $400. Once you either deposit or write checks for $30,000, for $50,000, for $100,000, it’s a psychological shift, then you start living life and I don’t mean consumption but you’re normalizing those things and it’s not much more of a big deal. Now, we’re looking at million dollars checks and sure, it’s no problem. Back then, I was like, “It’s a $10,000 check, I’ve never written a check that high.” And you’re normalizing things in your life which is actually a stepping stone to becoming. Because through this process, you’re becoming a more wealthy person. And that just doesn’t mean more money with more bank account, you’re becoming a person who normalizes that you deserve this, that this is where you live, that this is how you live, this is how you operate and once you become that, your checks become higher automatically because you won’t tolerate anything lower than that. Has that been your experience a little bit? Chantel: Yeah. I mean, I think about money in a totally different way. I mean, I guess I don’t even think about, you know, the money that I’ve made this last year. It’s great because I’ve never experienced that but at the same time, I don’t think I could go buy a new car. You know, just what I’m going to buy which is probably what I used to think and now it’s just, like, how I’m gonna reinvest it and keep going. And my son is learning a lot of the same thing too. He sees what I’m doing. And it’s funny because when those two properties that were next to each other, the buyers were like, “Okay, well, as soon as you close on it, we’ll close on it. Truly, we felt that we just wanted you on the title, that was our condition.” I’m like, “Okay, I can’t mess this up.” And so they had their paperwork into the title before it even closed. And so, I mean, I had just closed on another property the week before that and bought it for 30. And so my bank account was pretty low. So I scraped my savings, my husband and I savings, my son’s savings. And my son does not like to party from money and I was like, “Okay, I’ll pay you 5% on your money.” And he’s like, “Okay.” I mean, he made $200. So it’s kind of creating a mentality in him too how to invest and what to do with your money. It’s interesting. Jack: Beautiful. You’re aware, you’re creating legacy right here. Jack: Instead of letting school teach all the stuff that may or may not be useful, you’re teaching your son right now life skills and financial skills that will serve him well for the rest of his life. Chantel: I hope so. Yeah, because…I mean, I grew up with not a lot and so he’s definitely growing up with a different mentality than I had growing up because it was just how to get by kind of when I was young and so, yeah, it’ll be interesting. Jack: Beautiful. Well, I don’t wanna keep you much longer. I think it’s a perfect ending for our podcast here. So again, if you’re watching this on YouTube, we’ve put a couple of links into the description below. Very simply if you wanna know more about this, how does land flipping goes, you can…basically like house flipping just without the houses. So, therefore, much simpler but the same or better profits, you can simply go to landprofitgenerator.com or we’re gonna put the link right below here. If you’re listening to this on iTunes, we’re gonna put the link also in the show notes or you can just simply call our phone number at 602-712-0182 to just talk to us. In the meantime, I wanted to say thank you very much for taking time of your day. I’m super excited about your success. You’re on the path to one of our missions which is to create 1,000 millionaires out there. I’m super excited about that and make sure you let me know when you hit that mark so we can celebrate it and also probably earlier already become a candidate to induct you to the Hall of Fame, right? You just probably need a few more deals. And in the meantime, do you have any kind of last parting words that you wanna kind of leave with us with those listening whether or not they have a real estate experience or not? Chantel: I think probably the best thing I can think of off the top my head is just to be persistent. You know, and if you need something answered, get it answered right away and just keep moving forward, don’t put it off because it’s incredible how the answers just kind of come together when you just keep working at it. Jack: Wonderful. All right, so with that, thank you so much. Chantel, that was wonderful. I love how you’re creating legacy for your family and how your financial thinking has changed. That is huge and that is a real game changer. When that happened to us too when we went from what can we buy to how can we grow our wealth and grow our cash flow for that matter, then our entire life changed and I can just say it’s just a blessing to be able to live a life like that and I’m glad you’re going down that path. So for everyone, thank you very much. Thank you, Chantel. You all have a wonderful rest of the week. Make sure you check out “The Forever Cash Live Podcast” in iTunes if you’re not already listening to it on iTunes and everyone have a great rest of the week. Okay, bye-bye. Recording: Enjoyed this episode? Then make sure you like, subscribe, and post your comments and questions below the video. We’re looking forward to hearing from you.